The Enhanced IPP Isolated Power Panel includes an industry leading 6” back box depth and concealed hinged front. The IPP Panel is typically designed to supply 120V power to the circuits within a single operating or patient procedure room. It can be configured to provide high volt output such as 208V, 220V, or 240V. 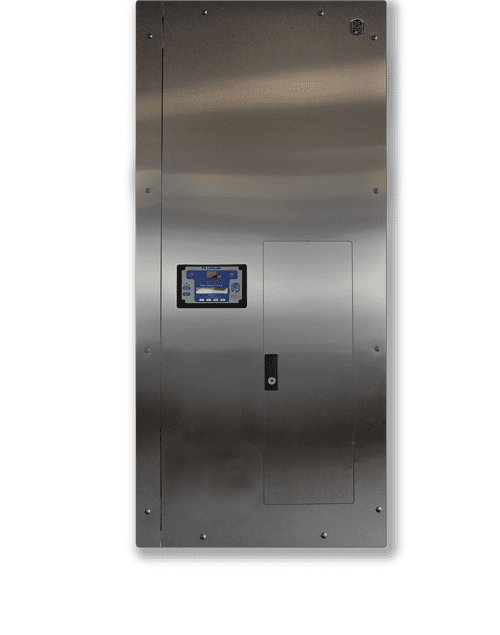 If the Isolated Power Panel is not installed inside the patient/procedure room, National Electric Code requires that a Remote Annunciator be installed so that it is “conspicuously visible” in the area served. Do not use pulling compounds to lubricate inside of the conduit. This will break down the insulation properties and raise leakage current. A dry talc powder may be used. It is typical to use conduit with a slightly larger diameter to ease pulling and avoid damage to wire insulation. An interior coating of PVC may also be used. Isolated power circuits must be kept separate from other circuits. Do not share the conduit or raceway with non‐isolated circuits, or isolated circuits from another system. See additional installation instructions and diagram here.